Looking down the barrel of 12 days of having the Bit home with me (admittedly, her dad was home for a lot of it, too), I knew I needed to come up with some new, interesting things to play with, at least until the Christmas presents arrived. 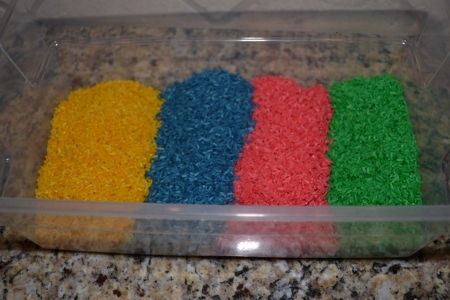 One thing I made was the “cloud dough” (which you might better know as moon sand), but another plan I had back then was to make colored rice. This tutorial is all over Pinterest in a couple of different forms, but the one I looked at was from Share and Remember. That mom has a bigger box than mine, and appropriate props (we just use some measuring cups and spoons I bought her as a toy a long time ago, a couple of plastic snack bowls and rubber duckies for burying in the “sand”) and her recipe is a lot bigger than mine. 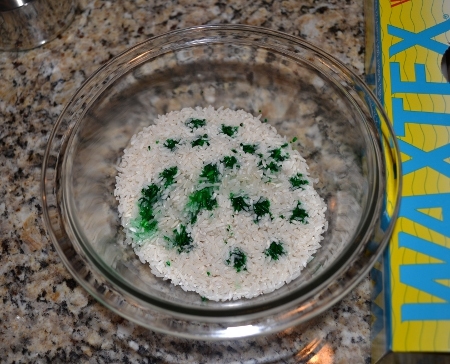 So if you want to make a smaller amount of colored rice, here’s what you do. You probably have all this stuff in your kitchen right now. Dump it in a bowl. Apply food coloring and a splash of rubbing alcohol. 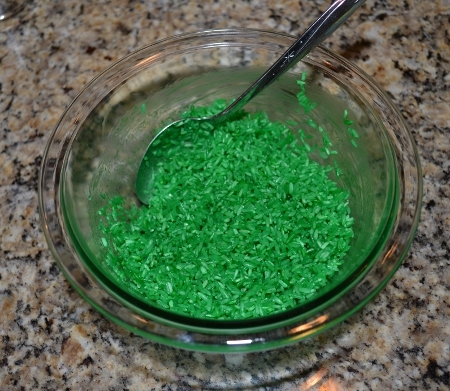 You just need enough to help distribute the food coloring; it’s going to evaporate anyway, so you can’t really use too much, but it will dry a lot faster if you don’t use a lot. 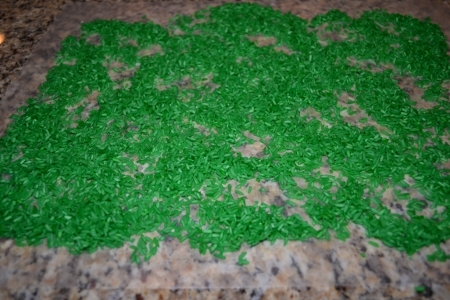 See, not too wet, just lots of green rice. 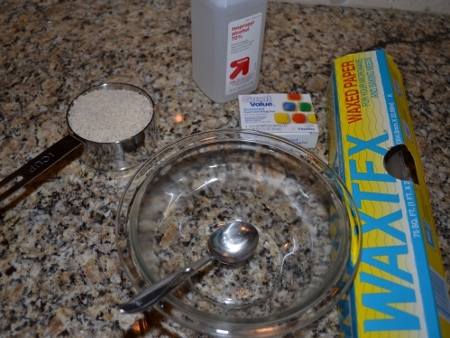 Spread the rice out on waxed paper to dry. The color becomes a little less intense when dry. Repeat for as much rice as you have, in as many colors as you want. When its all dry, dump in a box. It won't stay this pretty for long. I went with the four colors that I had in food coloring, but you can also combine colors to get different shades (I made a little purple, but not in the volume of the other colors, so I didn’t include it in the pictures) or use more or less food coloring to make light or dark shades. You could even throw in a little plain rice, too. The Bit loves this stuff and asks to play with it every couple of days. It’s messy, so you might want to try to keep it somewhat contained by playing at a table (or on a clean floor you can sweep to save some of the spillage).